This 350 ATV is full of torque. The new Crosslands 350 liquid cooled four stroke engine has seen an increased in capacity giving it a big boost in torque through the rev range and a smoother power delivery. 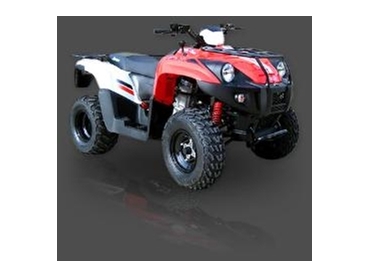 Aeon have concentrated on smooth power delivery that will help the Crossland 350 ATV Climb better than other rear wheel drive ATV without losing traction. The shaft driven rear wheels drive through a three speed CVT transmission that is easily operated by a leaver next to a large 17.8 L fuel tank. Like most modern ATV starting is via a button on the handle bar but what is no longer common is the benefit of an easily operated pull start if your quad ever has a flat battery, and the Crossland has this covered. The Crossland ATV is equipped with unique storage compartments under the seat and under the bonnet and a small tool carrying area at the rear and as well as front and rear carrier racks as standard. Sharing an ATV with a pillion is also possible with a large dual seat that is comfortable to be seated on for long hours of work.